I have been keeping my scraps in a large drawer of an antique buffet (cabinet). This is probably my most single favorite piece of furniture. Unlike modern day furniture, it is sturdy, HEAVY, and holds a lot of fabric scraps at the moment. I have batting scraps in one drawer, things like duck canvas in another, and quilting cotton scraps in yet another drawer which brings me to my present quandary. 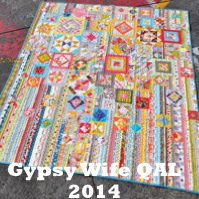 I recently signed up to participate in the Gypsy Wife quilt-a-long at Factotum of Arts. As you can see, the Gypsy Wife quilt pattern is rather scrappy looking. So rather than buy fabric, or use the larger cuts of my stash, I decided that I would rather use my scraps for this quilt since it appears to use such small pieces of fabric. And we are talking small scraps here. Anything around a fat-eighth or larger I typically fold up and put in a shoe box (or 3) with my regular fabric stash. So, what I would be pulling from this drawer is anything smaller than that. 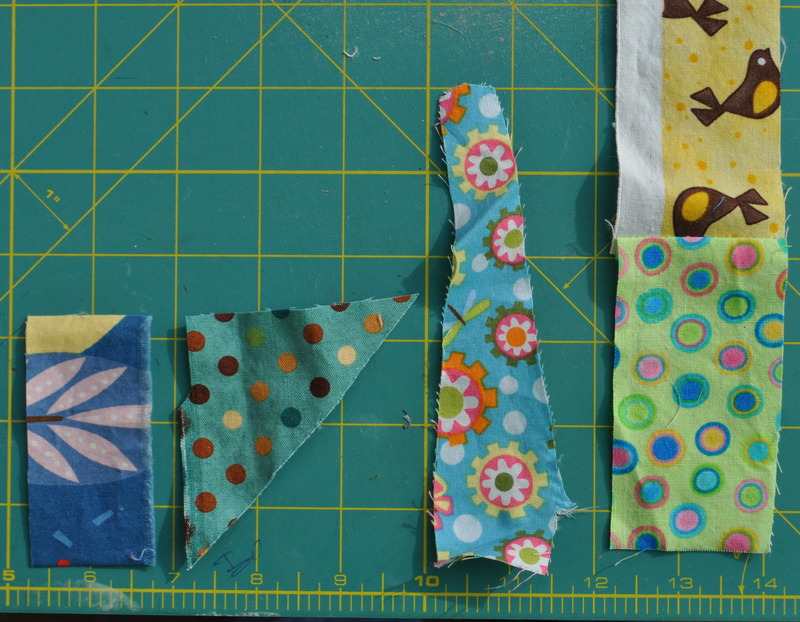 Also, I am not organized enough to have already cut my scraps into standard sizes – i.e. 2-1/2″ squares, 2-1/2″ strips, etc. So, how am I to sort through this crazy mound of fabric to arrange all this into some sort of usable concoction? Should I sort by color — all the blues in one pile, pink in another, yellow in yet another? Should I sort by shape — all the strips in one pile, triangles in another, squares/rectangles in another? Should I also sort by tone — warm colors in one pile, cool colors in another? Hmmm…. After pondering my pile of scraps for a while, I decided to sort by size. 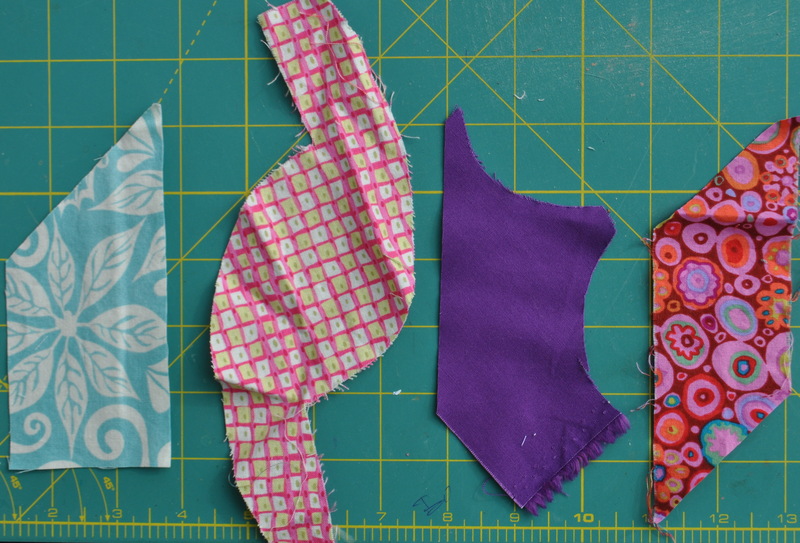 These scraps are all different sizes since they are such wonky cuts of fabric. So to make it easier I decided that if I could get a 4″ square or more out of a piece of fabric it went in one pile. Somewhere between a 3″-4″ square went into a different pile. 2″ in another pile, and 1″ in yet another pile. So, no matter if it was a triangle, square, strip, or just a wonky piece of fabric, I added it to the pile that would provide the largest cut square. I’m pretty good at planning so that when I cut larger pieces of fabric for a quilt, I end up with as little scrap as possible, so I wasn’t too surprised when the 1″ and 2″ piles ended up being the largest piles. I was surprised however to find some 5″ and larger pieces of fabrics in the pile. I must have thrown those in before I decided to fold them up and keep them with my regular stash. So far, the sorting has worked pretty well. Once I opened the pattern I was a little surprised at how the designer has you cut the fabric. She has you start with a larger, around 4″ square, and then cut into half or fourth’s diagonally to get the smaller triangles. 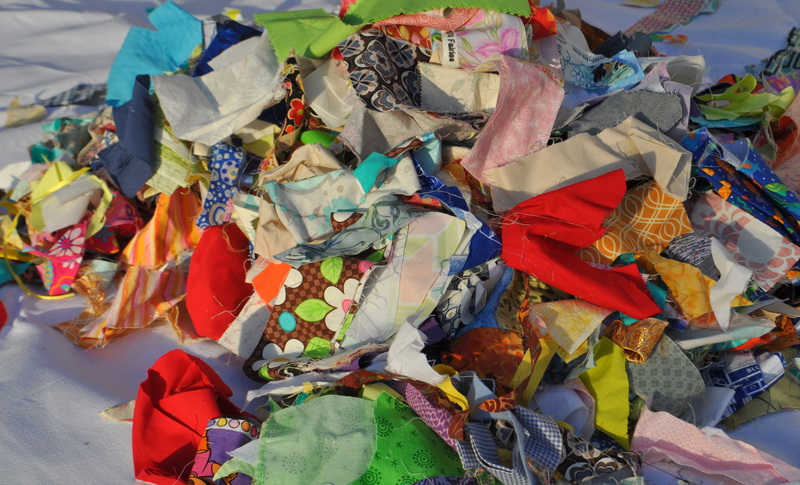 And like I said, I have much more 1″ & 2″ scraps, than I have 4″ scraps. So that kinda put a damper on using my small scraps. 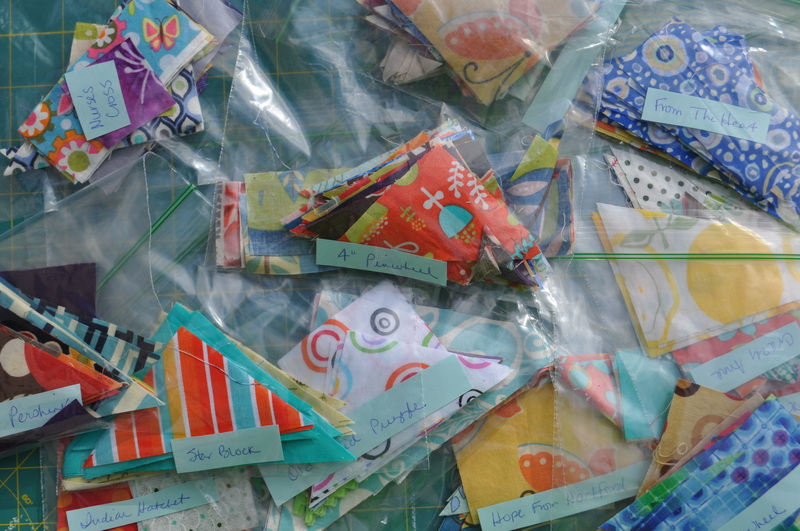 But, I was able to improvise and have cut the fabric for the first 12 blocks and put each in a little baggie. There is a mixture of cool, warm, print, solid, bright, and muted. This quilt is a lot of work, so I sure hope when it’s done, it looks wonderfully scrappy and not like fabric vomit. I might just have to find room for a design board so I can lay it out and get a feel for it before I start sewing everything together. Now that I’ve made it this far, I decided to search the internet to see how others sort their scraps. As usual, I’m a little backwards and try to invent my own method before seeing what other great quilters have already determined to be the best method. Haha. 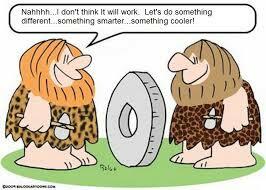 One day I’ll learn to stop reinventing the wheel. Bonnie Hunter has a great tutorial here. I would say the method I came up with is similar but much more simplified. She has 1″, 1-1/2″, 2″, 2-1/2″, 3″, 3-1/2″ piles, and then further sorts by strips, squares, or bricks. Maybe I’ll follow this method once I get more scraps and more space to keep the different sizes. I guess anything is better than the method I had last week, which was to jam them all in one large very stuffed and overflowing drawer. So, how do you sort your scraps? I’d love to hear from you. Maybe you have found an even better method. This entry was posted in Quilting/Sewing and tagged Gypsy Wife, quilt, quilting, reinvent, scrap, scraps, sorting, stash, wheel by monkeyneedle. Bookmark the permalink. I sorted scraps a few weeks ago. I have been using them in a sampler quilt. I kept mine in a shoe box. Enjoyed your post. Wow. You must have all your scraps very neatly organized to be able to keep them in a shoe box. Maybe one day I’ll get there… on second thought, knowing me, probably not! LOL. Thanks for visiting! I work full time and sew for pleasure some evenings and over the weekend. I tend to immediately turn whatever leftovers I have into mug rugs or potholders for gifts. The rest gets thrown away. I would gladly send you my leftovers! I might have to do it by 9×11 envelope though or you’d be waiting forever! Lisa, THANK YOU! I would love to take your scraps. I work full time (or more) and end up quilting just as much as I can fit into an evening or a weekend, so I understand how the scrap pile can grow slowly. I’ll email you. The Gypsy Wife pattern seems v. popular! I think sorting by color is very pretty. I love the pictures I see of fabric scraps in jars — a jar of blue, a jar of yellow, a jar of red, etc. It really brightens up a room. Thanks for visiting! I’m a new quilter and I’m finally getting enough scraps to possibly consider sorting them, but I have no idea how I’m going to do it. I have 3 bins for scraps – small scraps, larger scraps, and strip pieces. Knowing me, I’ll probably avoid my sorting my scraps for as long as humanly possible! Yep, that was me. Let’s not sort — let’s just throw them all into one large pile. I think I did try to sort one time but without a clear plan I wasn’t sure what to do with the pieces that might fit into more than one category. So I gave up. I like the plan I came up with this time — so far it has worked very well. Thanks for visiting.